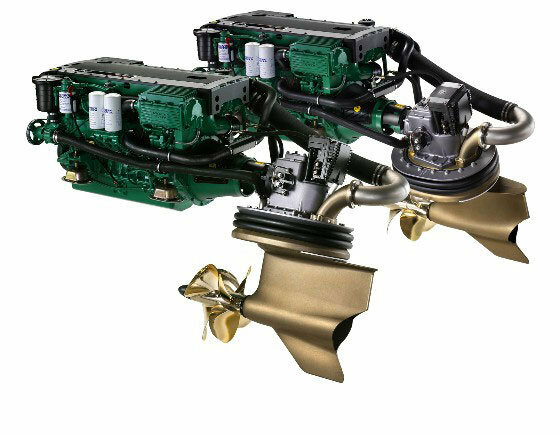 They may look a bit weird, but pod drives (like this Volvo-Penta IPS) are, simply put, the better choice. 1. Efficiency goes up by between 20 and 30 percent. 2. Handling is vastly improved. 3. Dockside handling is far and away beyond easy, and you control the boat with a joystick. Push it sideways and the entire boat moves sideways; twist it and the boat spins in its own length; nudge it in any direction and there the boat goes. 4. Weight distribution is improved, since the engines can be located farther forward or aft as the designer desires. 5. Useable interior volume of the boat goes up, since you don’t need to make room for angled shafts. 1. Over the long-term, maintenance expenses may – may – be slightly higher than with straight inboards. The bottom line? Pods are clearly superior drive systems. If you’re considering a new sportfish and inboards are in your future, you should try driving a pod-equipped boat, before stroking that check. Smart money says no matter how change-averse you may be, you’ll change your mind.